About Street Minister Gene Boswell; There is a lot in my past which is not worth talking about. But I would like to give you some idea where I am coming from. I guess basically I lived 35 years in sin because I chose to live that way. From age 15 in 1969 to 1973 was a blur of addictions, if it got you high I had used it. In 1973 I entered the U.S. Army and still was addicted to drugs, through to 1979 when I finished 6 years 2 months 13 days of military service. After getting out I thought the world owed me a living and by 1987 I had 3 felony convictions and had completed 2 five years terms of 15 months and 19 months under the old law. I bought my first Harley in 1980 and by 85 had four bikes each leaning toward a life of crime & drugs. From 1987 to 2003 was a blur of marriages and addictions. About Street Minister Brenda Boswell; I was born to a loving home and my parents were the best. I graduated in 1969 and my dad passed away that same year. So I got a little wild at the age of 20 and had my daughter, (with no regrets). In 1985 my life really got out of control with cigarettes, drinking and finally smoking pot, from pot I graduated to crack cocaine ( big mistake and regrets). While doing crack my mind told me I could become a dealer, so I did, got busted caught a felony and probation. My mother was praying for me but I was too busy doing all of the wrong things to listen. After all of that I thought finally got my life back on track taking care of my daughter, working and going to church every now and then, still smoking and drinking on the side. In 1989 I met my now husband and what an adventure, we partied hard with all of the wrong things and soon we were both smoking crack again. The big lie which satan told us is we were not addicts, but we were functioning addicts, we worked to support our habits. My mom and all of my family knew and tried to talk with us about our habits and living with each other, not married, until Dec. 25, 1993. We were so worldly, we lost our jobs and house in the city and had to move into the house, which I grew up in. We had no inside pluming, no legal electricity and wood heat. In this house our lives started to come together and we were there two years. Our ministry came to be while we were in the country. We moved back to the city in 2006, clean and free from and alcohol and drugs. My mom did not get to see the change in me, well not here on earth anyhow. I worked outside the home and my husband did ministry full time. I am now retired from outside work and very active in our ministry. I have been Ordained under the Lost Souls Ministry banner and am a Street Minister with my husband today. So you see I know God has plans for each of us because He had one for me. I will serve Him for the rest of my life. We go into the most spiritually war torn of communities, shut down the streets and spread the Gospel of Jesus Christ through preaching, praise and worship, food, drinks, clothing, and children’s activities to those who have lost all hope. Helping a hurt and dying world starts in your own community. You don’t have to look abroad to see the hungry, the poor, the lost, the abused. They are all around us. We are reaching out to people,churches and businesses in this our community with the hope that they will reconnect to their community through Lost Souls Ministry and provide an opportunity for the lost,addicted and low income families. This ministry involves connecting with compassion,empowering with resources and developing for the long term,all in partnership with this our community. Lost Souls Ministry is a volunteer ministry from the labor to the finances. If you would like to volunteer, please see our contact page. We CAN take back our communities if we all work together. 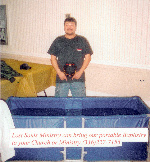 Lost Souls Ministry has a collapsible portable Baptistery. It is 24″ deep x 70′ long x 24″ wide and holds 200 gallons of water. Empty and folded up it weighs only 30 pounds. The Baptistery is filled and drained with a garden hose. We would love to come to your church, ministry or street to be a part of Matthew 28: 19-20.
modified by AyStur Web Services, Inc.